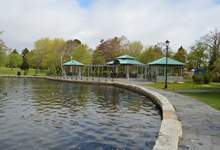 As part of the ongoing development of a Parks and Open Space Master Plan, the City of St. John’s is pleased to announce that Randall Arendt, the country’s most sought-after speaker on the topic of conservation planning, will be co-hosting a session on the City’s parks and greenways on Tuesday, March 25. Arendt is an author, lecturer, educator, and site designer specializing in land conservation through more compact development design. Propelled by the lamentable state of land-use planning in many parts of the United States, he is the author of more than 20 publications, has designed conservation subdivisions in 24 states, and has lectured in 46 states and seven Canadian provinces. Randall is an Honorary Member of the American Society of Landscape Architects, and a Fellow of the Royal Town Planning Institute in London. More information on Randall is available at www.greenerprospects.com. The City of St. John's invites residents interested in discussing our city-wide trail and green space network to a special session with Arendt and Jim Scott of Trace Planning and Design, the consultants assisting the City develop its plan. The evening will include a brief presentation that provides an overview of the project, thoughts on the importance of a city-wide greenspace network and a work session that explores St. John's important trail and green spaces as a network. Tuesday, March 25 at 7 p.m.